There have been a few articles, ( Forbes, Valley News) recently that talked about seized "new" vehicles at the Long Beach Port. I have been involved with the export, and import business for most of my life, so something just didn't sound right about these articles. Turns out, they really aren't correct. Customs is being used as a lackey by the OEM vehicle manufacturers trying to prevent individuals from profiting in a niche market. The thing is that customs is trying to enforce a "rule" that has nothing to do with exporting "NEW" cars rather it has to do with trying to prevent the export of stolen vehicles(19 CFR Part 192). This isn't anything illegal as the articles say, rather it is simple economics. The OEM manufactures do not want people to buy cars in the US and then sell them overseas. "The cars were then shipped to China and sold for profit. U.S. law prohibits the export of new cars." Not true. 19 CFR Part 192 was written to help control export of vehicles, vessels, and aircraft from the US. However it only addresses "USED" vehicles. "NEW" vehicles are not addressed because it is not necessary to meet the requirements of 19 CFR Part 192 for "NEW" vehicles. A manufacturer, distributor, or dealer does not need to present a title or MSO for a "NEW" vehicle to be able to legally export the vehicle. Sounds weird, sounds a little strange, but this is how 19 CFR Part 192 is written. "The Mercedes, BMWs, Lexus and Audi, and other luxury vehicles the two men illegally exported could sell in China for as much as twice their U.S. resale value, Kacavas said. 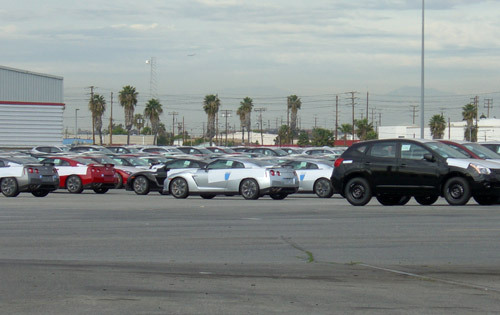 Fourteen of the vehicles, worth $750,000, were apprehended at the Port of Long Beach, Calif. Those vehicles are going through the forfeiture process, and Kacavas said he’s hopeful their value will be recouped." Is it illegal to buy something and then sell it for a profit? Something like a company stock(stock market)? Is it illegal for you to get someone to purchase this stock for you? Is it illegal to transfer this stock to someone else? Apple doesn't like it if you have someone stand in line and buy four iPhones for you. They like you even less when you list them on ebay and get more than MSRP for them. They might try and block you, but them having the police seize the iPhones that you purchased, well that is just robbery. In this case, the OEM's are having US Customs stop and seize these cars, lining the coffers of the manufacturer (They sold the car), Customs (They seize and sell the car), and the overseas distributor (No car from the US to sell against). Since the CFR only talks about "used" vehicles, there was no real definition of "new" cars. However this document from the Customs and Border Protection page helps clear up some of the definitions. The 19 CFR Part 192 reporting requirements apply only to used self-propelled vehicles; therefore, it is necessary to distinguish “new” from “used.” The term “new” is not defined in either the statute or the regulations; however, it is possible to derive the meaning of new from an examination of the term “used” as defined in Part 192 of the Customs Regulations. “Used” refers to any self-propelled vehicle the equitable or legal title to which has been transferred by a manufacturer, distributor, or dealer to an ultimate purchaser. An “ultimate purchaser” means the first person, other than a dealer purchasing in his capacity as a dealer, who in good faith purchases a self-propelled vehicle for purposes other than resale. Thus, a vehicle will be “new” for purposes of this provision if (1) the manufacturer, distributor, or dealer retains legal and equitable title to the vehicle at the time of exportation, or (2) the manufacturer, distributor, or dealer has transferred legal or equitable title to a dealer who purchased the vehicle in his capacity as a dealer. For example, a vehicle being exported will be considered new, and thus not subject to the provisions of Part 192, if a manufacturer sends an unsold vehicle to another of its own facilities in a foreign country to increase inventory or if a manufacturer sells a vehicle to an overseas dealer who will then sell it to an ultimate purchaser. The definition of a used vehicle, for the purposes of the reporting requirements, is not determined by the physical condition, economic value, or operating order of the self-propelled vehicle at the time of export. Conditional statements included on commercial or contractual documents do not influence the status of the vehicle as either new or used as defined in the statute. Thus, for example, a statement in a commercial transaction that says title will transfer upon delivery to the customer or at some other point after the export does not alter the definition of a used vehicle to make it “new” at the time that it was exported. If you have any questions not addressed in this booklet, please contact the local port from which the vehicle will be exported. Phone numbers can be obtained from the Customs Web site at www.customs.gov. The main point of this rule is to control the export of vehicles, not make it illegal to export "NEW" cars. There is no need to try and portray these vehicles as "USED" unless they want to try and export them out of the US without the required title or MSO. Thank you for writing about this issue. The government is clearly twisting the meaning of their own regulations to invent a reason to seize vehicles that are fully paid for, and then attempting to lump in vehicle exporters with car thieves and smugglers in their explanations. It seems like this should not be able to happen in the USA. Most reporters to cover this issue have just blindly accepted the explanations from customs and CBP as fact without checking the actual facts. Once again, thank you.